Are adventurers always men? We’ll begin this course with a resounding NO, before moving on to more interesting questions. Who can be an adventuress and what do they do? What's their relationship to domestic and public life? How do they serve or disrupt the goals of capitalism, colonialism and empire? In what ways do adventuresses and their plots mess with traditional categories of gender, race, class or even literary genre? 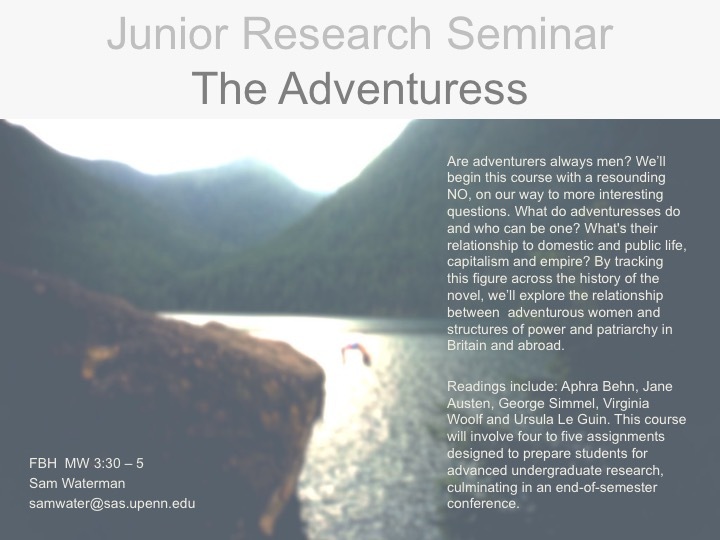 By reading the figure of the adventuress across a long history of the novel, we’ll explore the relationship between adventurous women and structures of power and patriarchy in Britain and abroad. Readings will include Aphra Behn, Jane Austen, George Simmel, Virginia Woolf, and Ursula Le Guin. This course will involve assignments designed to prepare students for advanced undergraduate research, culminating in an end-of-semester conference.